In the beginning of the manvantra (eon), there was a king named Satyavrata. He was praised by the Brahma, himself, as the humble among the humble kings. Since Brahma said nicest things about him, he started wearing the badge on his shoulders and became a bit annoying in his behavior. Though he used to do charity, in a similar way, he used to do in the past, but now he started taking pride in his charity work. Satyavrata started praising himself, so often, that Brahma got miffed by him and wanted to teach him a lesson. Though he was really a good person and Brahma wanted him no harm, Brahma requested the Narayana to come up with a solution. Now Satyavrata transferred the Matsya into a pond from the aquarium. As he started moving back from the pond, Matsya again outgrew him to the size of the pond and cried Satyavrata’s name for help. Awestruck by the sudden growth of the little fish to such an extent, but still not able to shed his badge of honor, the humble among the humble kings, he decided to transfer the Matsya into a river. At river bank, after transferring the Matsya, as soon as Satyavrata started moving back to his palace, Matsya outgrew him for one last time to the size of the river and cried Satyavrata’s name for help. And again Satyavrata found the Matsya in a bigger form. However, by this time, Satyavrata realized his folly and apologized for commenting on the size of the Matsya and self-praise. Satyavrata, then, requested divine fish to appear in the real form and Matsya appeared in the form of Narayana before Satyavrata and blessed him. In the end, Satyavrata became Vaivasvata Manu, the progenitor of the life on earth in the current manvantara and with help of the Matsya avatar and Saptarishis; he saved and restored the life on the Earth. 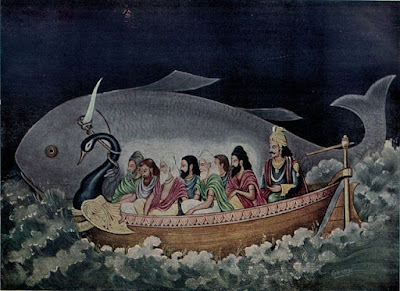 Though the above is a Hindu mythical story, how Manu and Matsya Avatar saved the life on the Earth, but it can be also interpreted as a morality tale or allegory about saving oneself. Instead of interpreting Manu as the progenitor of life on the Earth, we can identify him as ourselves, the progenitor of our very own life. Instead of simply interpreting, the great deluge as the great deluge, we can translate it as the lowest points in our life. Instead of saving the life on the Earth, it means saving ourselves. And instead of taking pride in our past works and achievements, we should be humble about them. Because humbleness is the art of knowing thyself and only a humble person can save himself in the harsh times.